Brown started his career as a farmer, growing tomatoes in southern New Jersey with his younger brother during high school and college. Shortly after earning a degree in agricultural science from Rutgers University in 1955, he spent six months living in rural India where he became intimately familiar with the food/population issue. In 1959 Brown joined the U.S. Department of Agriculture’s Foreign Agricultural Service as an international agricultural analyst. Brown earned masters degrees in agricultural economics from the University of Maryland and in public administration from Harvard. In early 1969, he helped establish the Overseas Development Council. 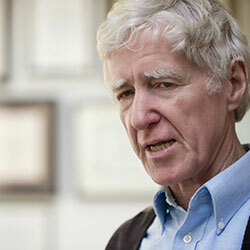 In 1974, with support of the Rockefeller Brothers Fund, Lester Brown founded the Worldwatch Institute, the first research institute devoted to the analysis of global environmental issues. Brown has authored or coauthored 50 books. One of the world’s most widely published authors, his books have appeared in some 40 languages. His most recent book is World on the Edge: How to Prevent Environmental and Economic Collapse. He is the recipient of many prizes and awards, including 25 honorary degrees, a MacArthur Fellowship, the 1987 United Nations’ Environment Prize, the 1989 World Wide Fund for Nature Gold Medal, and the 1994 Blue Planet Prize for his “exceptional contributions to solving global environmental problems.” More recently, he was was selected one of Foreign Policy’s Top Global Thinkers of 2010. To read more about Lester Brown, visit his personal site. Crossing the Lines: What’s the Future of Wind Energy?